Kayaking is the ideal ecological excursion to explore the fabulous coves and beautiful island shores in Bahia de Banderas (Banderas Bay). 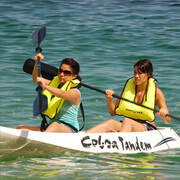 Join our naturalist English-speaking aquatic guides to paddle into the remarkable waters near Puerto Vallarta. We provide all the necessary equipment for a safe and fun-filled trip on the water. These kayaking adventures are great for nature enthusiasts who would like to see the natural marvels along the coastline of Banderas Bay. One of these excellent kayaking spots is Las Caletas, the fantastic former estate of a Hollywood director, John Huston. Huston popularized Puerto Vallarta as a vacation destination for United States visitors by depicting this coastal paradise in his film, Night of the Iguana. 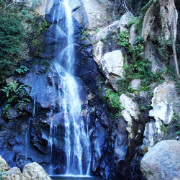 Las Caletas has a beautiful cove that is home to a splendid shallow-water coral garden. 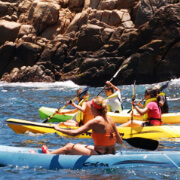 Los Arcos is another kayaking destination south of Puerto Vallarta in Banderas Bay. The granite islands of this group tower high over the surface of the Bay. The interesting rock formations at this site provide an intriguing view for kayakers as they encircle these islands. Tres Marietas (also known as the three Marietas Islands) is another great place for sea-kayaking. Located at the mouth of the Bay near the border of the Pacific Ocean, these isles are home to plentiful nesting sea birds, including the threatened blue-footed booby. 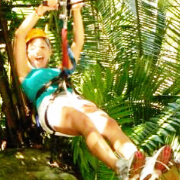 Our guides will make sure you experience a fun-filled and completely safe excursion as you paddle along the panoramic coastline of Banderas Bay. We’ll provide all of the required equipment on this trip, including kayaks, oars, life vests, and snorkeling gear.